It’s a picture as old as many of us can remember: that teenager with the bright, shiny, metallic smile. Yes, for millions, wearing braces has become a rite of passage. But times have changed in recent years. Braces are still used to correct “bad bites” and other orthodontic problems, but there are a number of new options available. In some cases, improvements in orthodontic technology mean patients can wear braces for a shorter period of time and still achieve desirable results. And braces for adults have become more popular. If you’re considering braces for you or your child, we at the Yuba City Dentistry Group want to do everything possible to keep you best informed. We encourage you to consider the following. An abnormal bite may include problems like malocclusions (crowded or crooked teeth) or misalignment of the teeth or jaws. There are a variety of reasons for these problems, including hereditary factors, injury, early/late tooth loss, or thumb-sucking. Although braces will help straighten out your smile, there is a more important matter at hand – namely, keeping you in good oral health. Braces can help treat and even prevent many of these problems from developing. Braces work primarily by administering continuous pressure on the teeth over a specific period of time. This pressure slowly moves the teeth, also changing the shape of the bone. Brackets: These are the small squares that bond directly to the front of the teeth (or sometimes the back), using special dental cement. Brackets hold the arch wires that actually move the teeth. Brackets come in a variety of colors and materials. In addition to their traditional metal form, you can also get brackets in plastic or even tooth-colored ceramic. Spacers: These small separators fit between teeth. Arch wires: Available in a variety of materials and colors, arch wires attach to the brackets and do the work of guiding the teeth into proper position. Ties: These small rubber rings or wires fix the arch wire to the brackets. They also come in a variety of colors. Ligatures: These are small elastic bands that hold the arch wires to the brackets. 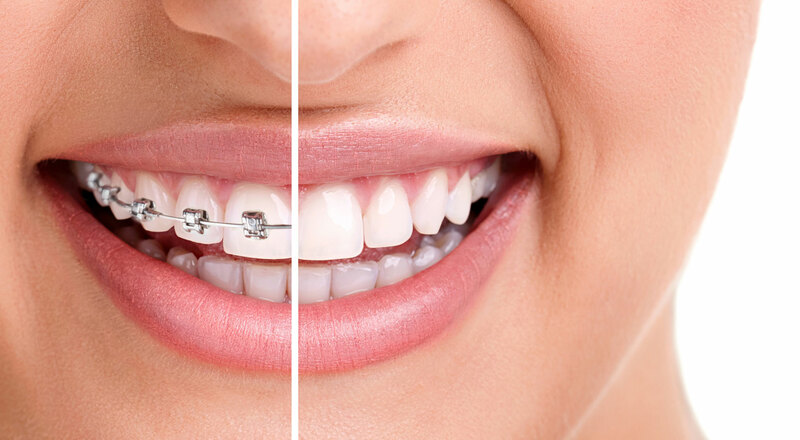 In addition to these primary components, braces may be comprised of an additional variety of bands, springs and other parts. Some of these adjustments will cause soreness or discomfort. Your orthodontist will try to reduce this discomfort as much as possible. Over-the-counter pain relievers are usually sufficient for managing pain. The answer to this question varies from patient to patient, depending on a variety of factors including the problems being addressed and their severity, the amount of room in the mouth, and the oral health of the patient. On average, most patients wear braces between one and three years. In most cases, once braces are removed the patient must wear a full-time retainer for at least six months, and then only during sleep for a number of years. Although braces involve an initial investment, the orthodontic problems they prevent can save much more money in the long run. Some insurance carriers partially cover the cost of braces, and here at Yuba City we’re happy to work out a payment plan that suits your budget. If you’d like more information about getting braces, make sure to check out the related pages on our website. And feel free to make an appointment, as we’re happy to answer any of your questions.